It is time for homeowners to start including their pets in their emergency plans for disasters such as bushfires and cyclones. Dr Mark Perissinotto, from online pet supply retailer VetShopAustralia.com.au, said animals are often the forgotten casualties of natural disasters but the best thing people can do for themselves and their pets is to be prepared. “Emergencies such as bushfires and cyclones are an all too common occurrence in Australia and their effects can be devastating,” Dr Perissinotto said. Dr Perissinotto said householders could boost their pets’ chances of survival with a pet emergency rescue sticker, which is designed to be placed in a prominent position at the front of a house. “The sticker alerts emergency crews to the number and the type of pets that you have in your house, reducing the amount of time it takes crews to locate them and ensuring your furry friends are not left behind,” Dr Perissinotto said. 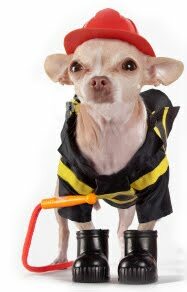 “Pet owners should also create an evacuation plan, which includes a list of pet-friendly accommodation that you can go to and the contact details of animal boarding houses and shelters. Householders should also ensure their pets are micro-chipped and wearing ID tags in the event they go missing during an emergency, and create a pet emergency supply kit containing items such as food, bottled water, a bowl, first aid, blankets and medications. “Try to take your pets with you in an emergency situation but remember to put your own safety and the safety of your family first,” Dr Perissinotto said. VetShopAustralia is giving away pet emergency rescue stickers. To order your free sticker visit www.vetshopaustralia.com.au/petrescuesticker.